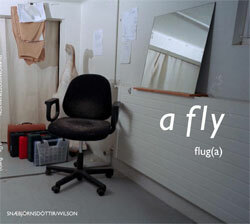 (a) fly is a project extending the artists cycle of projects examining human relationships to landscape and environment by way of observing the human/animal interface. In this instance we are concentrating on domestic animals and animals within an urban environment. Originally titled 'a fly in my soup' (flug(a) í súpunni) it makes reference to an often awkward and sometimes problematic collision between culture and nature. By taking the city and even the domestic environment as the coalface of this exchange it seeks to stake out new ground for a reappraisal of the way we relate to the wider environment as revealed through this particular set of relationships. The project hinged on a survey, in which by shooting at a map of downtown Reykjavík four ptarmigan hunters were able to select specific homes which might host pets. A further key component of the project was a series of photographs taken of the environments (homes) of domestic animals either constructed or provided by their keepers and often chosen by the pets themselves within the environs of their hosts. The publication is well illustrated with images of the shooters, the survey and all the animal dwellings included in the project. It includes writings by Dr. Karl Benediktson "Reykjavík - animal city", Dr. Ron Broglio "Making space for Animal Dwelling" and Dr. Mika Hannula "Shotguns, maps and household pets".